In the depths of the Himalayas, seventeen-year-old Hari Rai regularly treks from village to village, hilltop to hilltop, with loads piled on his back. His most recent cargo is certainly the strangest: a primitive, red Coca-Cola fridge in need of repair. 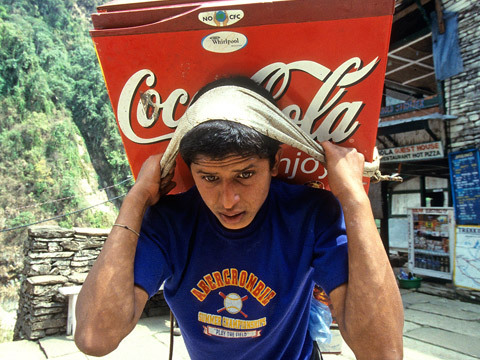 One of 60,000 Nepalese youths who work as porters, Hari carries cargo to make a living and pay for his education. He usually transports backpacks for tourists or serves as a messenger for families who cannot afford to visit each other, delivering anything from grain bags and livestock to the latest news and greetings. There is something cheerful and amusing about the red fridge that belies the challenging circumstances of the spirited young man who carries it. Making his way from virtually inaccessible corners of the mountains to a repair shop in town, Hari encounters fellow porters who carry equally eclectic cargo. These itinerant companions have come to know each other through their mountain journeys. Villagers, who consider him a messenger of good tidings and gifts from faraway families, gladly offer Hari homemade meals and a place to rest his tired feet. Despite the strains of a porter’s lifestyle, Hari always keeps his head high, keeping his focus on his hopes and dreams while he delivers hope to others. Lucian and Natasa Muntean, the Lunam Docs, are an independent documentary production duo dedicated to creative documentary filmmaking on social issues around the world. Their films, Punam (2005), Journey of a Red Fridge (2007), Big Sister Punam (2010), and Mbambu and the Mountains of the Moon (2011) have been screened at over 100 international film festivals, received more than 35 awards, one of them the UNICEF Award for Children Rights and have been aired on major TV networks worldwide. In 2007 they founded Punam Fund, non-profit fundraising organization dedicated to reducing the number of illiterate working children in Nepal by providing them scholarships.